G500 4×4² has finally been revealed by Mercedes. The much awaited for model has appeared in a picture that the company has published, along with information regarding the new model. 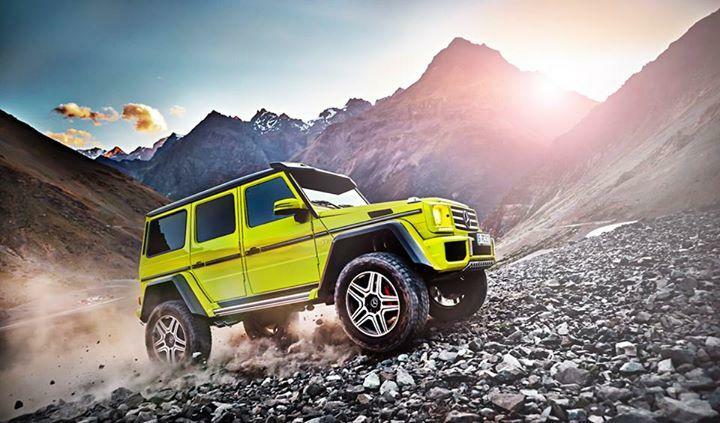 As far as pricing goes nothing is yet official, but the car will cost less that the 2015 G63 AMG 6×6 that is priced €451,010 (VAT included) in Germany. The new car is just a a four-wheel variant of it’s sibling that counts two more wheels. This is if we take just a look at the G500. But technically the car benefits from larger 22-inch wheels with 325/55 off-road tires, increased ground clearance and a modified body with carbon fiber attachments. Under hood arsenal sounds perfect as the new G500 4×4² runs on a V8 engine developing 422 HP (310 kW). As a reminder the model was confirmed last year after it had been seen testing and caught on camera. And it is also important to say that Mercedes has been frugal on offering details about the G500 4×4². The car will most likely go into production this year. But don’t get too excited as only a few pieces will be produced. This entry was posted in Mercedes-Benz and tagged G500 4×4², Mercedes, Mercedes G500 4×4², Revealed. Bookmark the permalink.